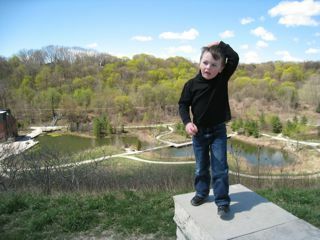 Evergreen Brickworks Toronto, originally uploaded by HeadsUp_Dad. In the spirit of tipping our hat to the place that gives us everything we need to sustain life, today’s post is going to relate to Environmental Stewardship of our planet. Specifically, the essential role we play as parents, cultivators and influencers of future generations. We at Headsup Dad do not want to spend a lot of time protesting or complaining about things. We know what is looming. Lots of very bright and knowledgeable people are covering the story. We are more interested in learning from these people, learning from past mistakes (our own, and those that are made by others), seeking out the opportunities for positive outcomes and finding or creating the path towards the light at the end of the tunnel—and moving forward with purpose and conviction. There is not much we can do to influence what has come before us, but we can influence what happens next. With that in mind, its time we took a serious look what we have to deal with in terms of global warming and climate change, what we as parents can do to make the changes that are necessary to set the stage for improvement, and help empower our kids with the knowledge and tools to dig themselves out of the situation that has been created for them over the past 150 or 200 years. It begins at home, with our kids and in our own back yards. In our parks, and our forests and our fields. In our rivers, lakes and oceans. In the country, in our towns and in our cities. Everywhere we look there is opportunity for change. What we do today affects the cities we live in tomorrow. Since 1991 Evergreen has been engaging Canadians in creating and sustaining dynamic outdoor spaces—in schools, communities and homes. By deepening the connection between people and nature, and empowering Canadians to take a hands-on approach to their urban environments, Evergreen is improving the health of our cities—now and for the future. 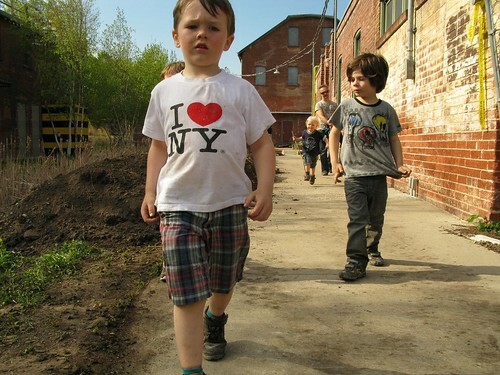 The Evergreen Brick Works is a unique environmental community centre and green cities centre for urban sustainability. Currently under construction in the heart of Toronto’s Don River Valley, this spectacular natural and industrial heritage site and its ongoing engaging programming from Farmers’ Markets to seminars and plantings, is already inspiring and educating the community to embrace a sustainable future. When we celebrate its grand opening in September, 2010, the Brick Works will be a showcase for green building design, environmental stewardship and a model for sustainability. 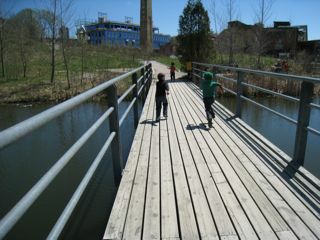 The revitalized turn of the century Brickworks compound will feature an ecologically diverse area with lots of history, a fine example of urban renewal and naturalization, a bunch of really old buildings and one brand spanking new new structure—the Centre for Urban Sustainability—a five-storey LEED platinum (Leadership in Energy and Environmental design) office building. Aspiring to the very highest standard within the LEED certification scale, this building will be an international destination for those interested in sustainable built environments. Evergreen, along with community partners, will be housed together in this hub of social and environmental innovation. No mind is too small to sow the seeds of change. At HeadsUp Dad, we believe that the continued existence of the human race on this planet is going to depend on how well we educate and inspire our kids to become aware and in awe of the world that we live in. To know nature is to love it, love leads to respect, and to respect is to take ownership of and stewardship over the gifts that we have been given. Knowledge leads to action and that the more that people know about the effects of their actions, the more likely they are to think about what they do. Evergreen is a not-for-profit organization that makes cities more livable. Corporate sponsorship, private donations and public support make its programs possible—Volunteers help drive its programs forward. Volunteering at Evergreen offers you and your family a great opportunity to help the environment right in your own community. Come out and get your hands dirty, meet a few new friends and… make a difference. Evergreen has events planned in communities across Canada all summer long and they could use your help. Get outside, have fun, teach your kids about the wonderful world we live in and help a worthy cause. To learn more about stewardship and planting events and other volunteer opportunities in your area, visit the Evergreen Website. Click here to see a list of some of their current volunteer opportunities. Take a look at their calendar. Please take your time and look for something you might enjoy doing with your kids on a sunny Sunday afternoon. See what fits into your life. Reach out, connect, let them know what you are interested in volunteering, or even better, apply to a role that suits you! You can complete and submit a Volunteer Application Form right on their website. 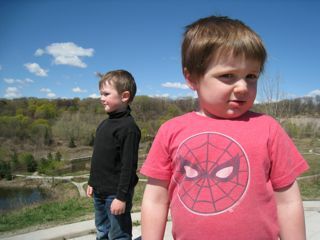 Together, we as parents can work together to create a culture of appreciation and respect of our natural environment. By getting engaged and supporting organizations like Evergreen, we all can look forward to a healthier, more sustainable future in which people and nature thrive together. 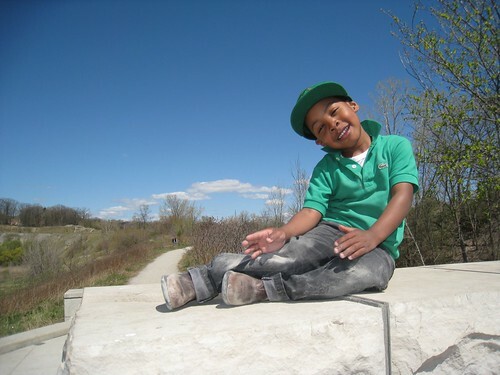 Do you have any photos of your kids outdoors, enjoying play and learning about the wonders of their natural environment? Send them in to us here at HeadsUpDad, we’ll post them for all of us to share and enjoy—who knows, maybe it will lead to something fun for you and your family. Next post: Where can your kids play soccer or baseball?